Motion Picture Rating (MPAA): R for strong brutal bloody violence throughout, and language. Set in Indonesia — where doesn't really matter, the topic is universal enough — a squad of cops, some rookies, as it turns out, are sent into a tenement building intending to handcuff, shoot, and fight their way to the top or wherever they need to go to capture the notorious, and need I say, ruthless, crime lord who runs the place. Indeed, it seems he runs the entire neighborhood with the aid of corrupt city officials and corrupt cops. Nothing new there. But it does make for a potentially exciting adventure. First off, this movie claims to have won several awards. Okay. Not sure why. There's lots of audience hype about this movie, too. Not warranted in my opinion. Secondly, there are apparently two versions of the film. One has subtitles. According to one reviewer, you needn't worry about the subtitles because the characters don't say much. I watched a dubbed version. It seemed most of the characters only knew the F-word. No matter. The action is practically endless — you can figure that part out for yourself fairly easily although it's practically impossible to tell one cop from another except for the older white-haired guy, until you get down to the remaining half dozen. There's not a lot of story line. You'll quickly figure out the cops are out-gunned and out-manned by the hoards of uncooperative machete wielding tenants and equally vicious crime lord's men. I understand that Far Eastern movie audiences prefer longer movies. That's okay with me, usually. I generally like martial arts slug-fest movies too. 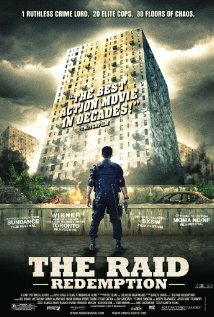 But THE RAID: REDEMPTION is way too long, at 101 minutes, for the story they're telling here. Some of the fight scenes were so long, and so repetitious, that I was hoping that any of the fighters would die — cops or bad guys — just so the fight could end even a few minutes more quickly! Had the movie stayed with the standard and very successful plot device employed by kung-fu movies — the good guys try to take out the bad guys but are unable to win so they retreat, practice, hone their skills, recruit help, and come up with a viable plan on how to beat the bad guys, then attack again — now that would have been 101 minutes of action worth filming. Instead, the cops behave stupidly from the beginning. They have trouble entering the building. They are soon compromised but what do they do about it? Nothing. When the bad guys — who incidentally have more weapons and fire power than the police — begin firing at the pinned down police from the interior balcony a floor above, the cops stand up to see where the bullets are coming from. That little maneuver quickly thinned out their police squad. (I'm thinking even rookies should have some insights into blazing gun battles if they watch TV or action movies.) I can't even remember how many of the trapped cops looked out of a window to see what was happening outside and took a bullet in the head or chest for their effort. Let's just say, way too many! It also seemed as if everyone the police encountered had the fighting skills of a professional mixed martial arts fighter. If you're making, dealing, and/or using drugs all day and night, living in a cramped tenement building, when do you have time to gain or even keep up with vicious martial arts skills? I'm sorry. I wanted to like this movie but it was just too silly. The cops acted stupidly. The fight scenes were so far over the top as to be laughable. I have over 20 years experience as a martial artist so I have some idea about fighters and strength. Not even considering the physical damages that would have been inflicted, making the length of the fights in the film impossible. I mean, really, if you can't hit or kick hard enough or with enough precision to bring down your opponent in 15 or 20 minutes, you need more practice, more help, or you need to just give up and congratulate your opponent, even if he is one of the bad guys. I do not recommend this film to anyone.